How Much Do Dental Implants in Fairfax Cost? Dental implants have quickly become one of the most popular replacement solutions because of their unique health and aesthetic benefits. They provide patients with a restoration from the tooth root up, providing a natural looking and feeling smile. However, many people have questions about the cost of dental implants in Fairfax. Keep reading to learn more about what contributes to the cost of your implants and what your next steps are if you want to replace your teeth with them. 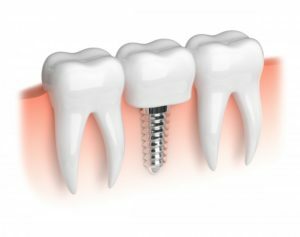 Dental implants are small titanium screw-like posts that are surgically placed in your jawbone to act as artificial tooth roots. Because titanium is biocompatible, it allows dental implants to permanently integrate into your bone, which makes for an extremely stable support for dental restorations. How Do I Know the Price of Dental Implants? The cost of your implants is hard to determine without examining your mouth first because of the many variables that go into the procedure. The best way to receive a fair and precise estimate is to visit your dentist in Fairfax. They will carefully examine your mouth, your oral health, how many teeth you’re missing, and where you’re missing them. These factors play a central role in the cost of your treatment. Additionally, you must account for the restoration itself. You will need a dental crown, bridge, or denture to fully restore your smile, which is an additional cost to the implants. It is a simple fact that dental implants cost more than most replacements, but this is for good reason. Dental implants have the potential to last a lifetime, making them the only truly permanent solution. Additionally, dental implants are the only replacement that keeps your jawbone strong and healthy by providing it stimulation. When you lose teeth, you lose some of the stimulation that they once provided, which can lead to jawbone deterioration. Dental implants can eliminate this problem! While their cost up front is more than other solutions, the money that you save with a long-lasting replacement that mitigates other health issues will end up saving you money in the long run. Does it sound like dental implants are right for you? Contact your dentist for a consultation to receive a more precise estimate on the cost of your treatment! At Fairfax Dental Group, Dr. Marjun Ayati and Dr. Brenda J. Young offer dental implants to provide their patients with unmatched confidence and function. They even have CareCredit financing that can help make this quality treatment as affordable as possible. For any questions, they can be contacted through their website or by phone at (703) 560-6301. Comments Off on How Much Do Dental Implants in Fairfax Cost?